While doing the regular clearing of my belongings to make way for child rubbish, I stumbled across a throwback to my childhood. These are evidence that I was a good girl growing up! 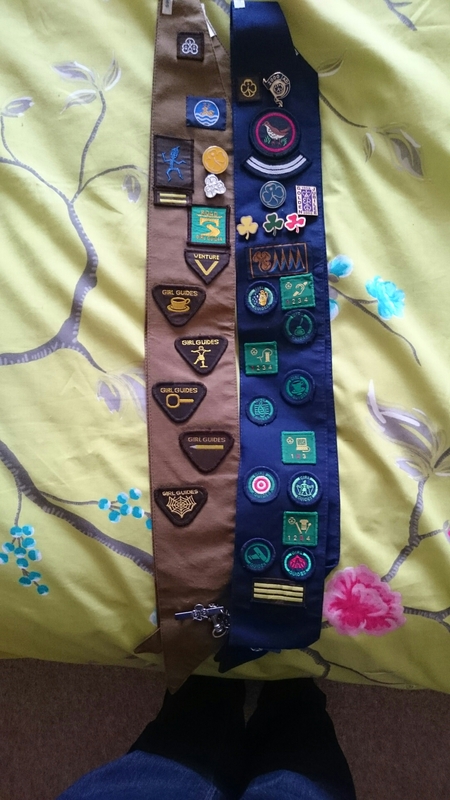 The brown sash is from Brownies, and the blue one, Guides. I was clearly a much better Guide as the badges go down the back too! I was also obviously very geeky as I even had the aircraft badge! I have been all the way through Girl Guiding from Brownies, to leading my own pack. I have stopped since having my family as I just don’t have the spare time at the moment. Maybe, once the children are bigger, I’ll go back to running my own pack. I am really looking forward to all my children being old enough to join Girl Guiding and Scouts. I had so many amazing experiences and met lots of fantastic people. That is something I really want my little people to have as well.